That James C. Sutton Sr. was once highly regarded in this community is beyond doubt. He was a blacksmith, an inventor, a successful businessman, and a successful farmer. He and his wife raised nine children, John L., Mary C., Charles W., Henry L., Sarah W., Kate C., James C. Jr., Joe (Josie) A., and William B. Sutton. His namesake, James C. Sutton Jr., was active for a very long time in the local school district even giving land (as his father had done earlier) for one of the school buildings – the Sutton School on Cambridge. Another son, Henry, was the first presiding justice of the newly organized St. Louis County. The first meetings were held at the Sutton mansion. 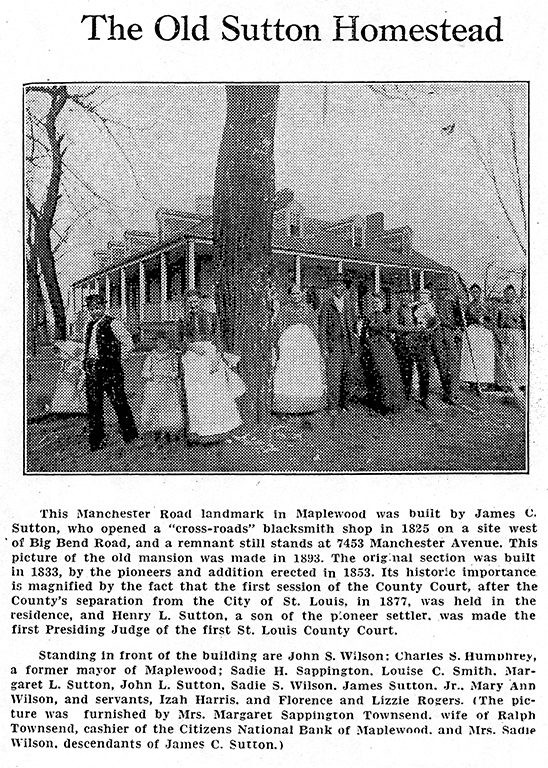 William Lyman Thomas, in chapter five of his “History of St. Louis County”, mentions an early school in Maplewood known, in 1854 as The Washington Institute. James C. Sutton Sr. donated the land for the school and was also the chairman of the board of trustees. He held that position until 1866 when his son, John L. Sutton Sr., took over. John L. was succeeded by his brother, John C. Sutton Jr.. J.C.Jr. remained on the board until 1908 when he declined to serve again. William Lyman Thomas, who seems to have been a very honorable man himself, writes glowingly of James Sr. Even mentioning, as others did as well,that he was of a very stern but reasonable manner. We have much positive information about him. Yet, we also know that he was a slaveholder. WLT never mentions that. We know that Sutton’s wife, Ann, in April 1860, paid the equivalent of $33,350 in 2019 dollars for four human beings. Almost exactly one year later the Civil War began. She most likely made that purchase with his knowledge and approval. And the human beings that she bought – a young woman and her infant daughter – a six year old female child and a two and a half year old boy. Horrendous to our minds today. We cannot imagine it. Members of the Sutton and the Rannells families have contributed much to our community. They deserve recognition and memory. That their grandparents held slaves is true but unpleasant to contemplate. It is very important to remember and honor these enslaved and indentured people who are every bit as deserving of recognition for their role in creating the world we know today. In many of the records their names were not preserved. There is nothing we can ever do that could somehow pay back all of those who suffered and died. But we need to do what we can to respect and honor them. The battle to prevent that sort of evil from rising again is ongoing and unending. Courtesy of the Maplewood Public Library. Doug H, you might enjoy this new addition to the STL Mercantile Library (I learned of it through the MO Historical Society Library and Research Center). The intro in particular is fascinating, also some great local ads! Wow, great find Kim. Thanks for sharing. The 1909 Maplewood City map at the end blew my mind. All the train and street car tracks! People be sure to click on the pdf icon (at the end of the title) to download a pdf of the book to your computer if you want it. That was an interesting link! The map was amazing! I did not know that Big Bend’s name changed to Pennsylvania Ave along the way. Is it Pennsylvania Ave on the north side of Delmar today? My block was not yet developed, I am on Gayola. And many of the streets have different names now than shown on the map. I really enjoyed that, thanks for sharing. Kim, thank you very much for this link. The Maplewood Public Library has an original copy of this 1912 Maplewood Directory. I have a hard copy of it that was made by someone with a copy machine. I have looked at the original a number of times but had never seen the map at the end. It was probably removed by someone along the way. Our library also has an original copy of a 1915 directory. At this moment I can’t think of any others. There also exists a 1909 map of Maplewood that is from the Plat Book of St. Louis County of the same year. It is very interesting because it shows all of the footprints of the buildings as well. There is a copy hanging on the wall of the council chamber. I have a digitized copy that I’m happy to share with anyone. I took photographs of the original at the Headquarters Branch of STL Co library on Lindbergh. Our library also has a hard copy of that one. It would be great if there was some way to trace what became of the enslaved (family?). I agree, Peter. We should all know who they were and where their ancestors are. Doug, The text under the photo states, “on a site west of Big Bend Road, and a remnant still stands at 7453 Manchester”. Since 7435 Manchester is east of Big Bend, was that a mistake? Also, can we assume that the remnant mentioned is now gone? DS, It was East of Big Bend. If you go to the St. Louis County Government website you can see part of the structure in the 1955 Aerial image that you can access. You have to click on the 1955 image and unclick the 2016 image. Then look at the area of Manchester that Dobbs is currently located and part of the mansion is visible in the upper right hand corner of the lot. DS, My apology for taking so long to reply. Mike is correct. The mansion was east of Big Bend. From vintage photographs one can tell that the western most half of the south facing facade had been removed sometime before 1954 when the rest of the mansion was razed. A couple of those photographs were included in this post on the subject.